A United Nations doctor, a WHO Epidemiologist whose area of work was in Kenya and Africa just took at Obama’s Kenyan birth certificate. The birth certificate allegedly issued by the Coast Province of Kenya (where Mombassa is located) has been shown to be a copy, based on an Australian birth certificate form available on line. 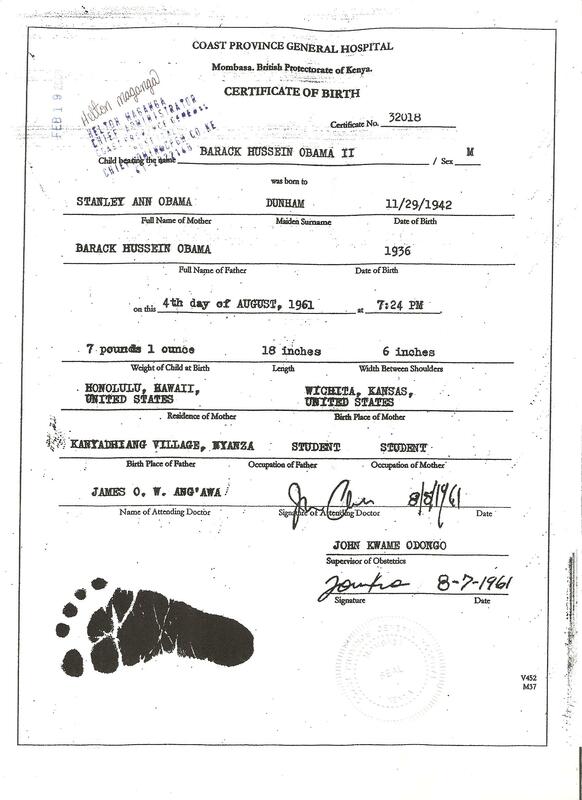 The real Kenyan birth certificate issued in 1978 looks completely different from the Obama one shown on line. The hospital birth certificate is implausible for several reasons. Coast General is a government hospital, and would probably have admitted only African patients in 1961, under the racist colonial regime. The doctors who allegedly delivered the baby would never have been Africans, in any case, in colonial Kenya. When my son was born, 15 years after independence, most white women still delivered at the former ‘whites only’ hospital, now a very good and expensive private hospital, and most of them had white or Indian doctors. The hospital where my son was born, a Catholic hospital, did not issue a birth certificate—and nobody took his footprint. In fact, I obtained his full birth certificate from the Nairobi City Council, by showing them a temporary document issued by the hospital. This was the only legal procedure for getting a birth certificate (which I needed in order to get his US citizenship documents). In order for Obama’s mother to take him back to the US, if he was actually born in Kenya, she would have needed to get a Certificate of his US Citizenship [issued by the State Department] and to have him added to her US passport or issued with his own US passport. Otherwise he would have had to enter the US as a British subject (son of a colonial subject father) and been naturalized. It is very easy these days to forge things, and Kenyans, like other people, will do and say things for money. I wouldn’t worry about the ‘birther’ misinformation. They will never give up. To side track a bit, Obama in his 2008 presidential campaign, used the slogan “Change we need” and “Change we can believe in”. Now 2 and a half years into his presidency, any major positive changes, economic, political, social, international, etc achieved? Or in process of achieving? I could only think of the Nobel Peace prize awarded to him in 2009, shortly after being sworned in as President. And with the ongoing conflict now in Afganistan and a new one this year in Libya! Maybe with a good campaign again but with a new slogan, he may well be on a 2nd term, thanks to the way of the US presidential election system and how the Presidency actually functions. Unfortunately, the Obama of today is nothing like the Obama of 2008, or what he represented himself to be. He is more like Bush with all the wars, including Libya, the foolish escalation in Afghanistan, and possibly on the horizon, a war in Syria – not to mention the secret US bombings in Yemen. None of this wars should have happened. Do you have any integrity at all? Did you, yourself, confirm or look into these claims before you published them on your website? Each point that your raise in this report can be categorically refuted. One of two possibilities is apparent after reading your report: (1). The “United Nations doctor, a WHO Epidemiologist whose area of work was in Kenya and Africa” that you state “just took at Obama’s Kenyan birth certificate” DID NOT look at this Kenyan birth certificate. (2). 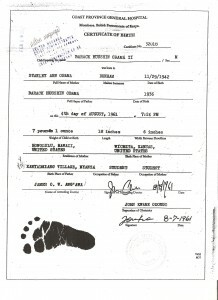 The “United Nations doctor, a WHO Epidemiologist whose area of work was in Kenya and Africa” that you state “just took at Obama’s Kenyan birth certificate” DID look at this birth certificate but based his findings on data that he found floating online, since 2009, that other individuals have used to refute a DIFFERENT Kenyan birth record. Your doctor friend (possibly a strawman, or maybe you) stated, “The birth certificate allegedly issued by the Coast Province of Kenya (where Mombassa is located) has been shown to be a copy, based on an Australian birth certificate form available on line.” Your doctor friend is referring to completely DIFFERENT Kenyan birth certificate. The document that he is talking about is known as the ‘Bomford’ forgery/certificate. Moreover (as if this is even need after the above listed malicious mistake/error/hit-job), the other points listed in your report amount to nothing more than a distracting rant. Perhaps you should take up fiction writing. How is anyone to take your ‘books’ seriously now? You’ve done yourself a great disservice. I sincerely hope that your books are much more accurate, and better researched, than this report that you have publish on this blog.